This site was constructed as a monument to the life of my father. As he was a computer geek since the 1960's, I think that this medium makes for a fitting memorial. Click on the tabs above to select Pictures, Anecdotes, etc. This tab only shows the published obituary. 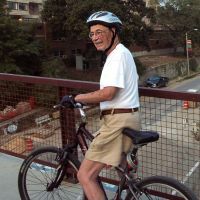 Feb. 23, 2006 -- Cosmic-ray astrophysicist Joseph Klarmann, Ph.D., a professor emeritus of physics in Arts & Sciences at Washington University in St. Louis, died Tuesday, Feb. 21, 2006, at St. Mary's Health Center in Richmond Heights, Mo., of complications from a bicycle accident in Forest Park last September. He was 78. As a member of Washington University's cosmic ray research group, Klarmann was involved in some of the world's most successful studies of the composition of galactic cosmic rays, highly energetic atomic nuclei that travel through space at nearly the speed of light. Klarmann helped develop innovative instruments that have been used on high-altitude balloons and later on spacecraft. Born Jan. 16, 1928, in Berlin, his family escaped Nazi Germany, fleeing to Palestine via Italy in late 1939. His university studies were interrupted in 1948 when he served in the Israeli Army during the War of Independence. After the war, in which he was injured, he returned to Hebrew University in Jerusalem, where he received his master of science degree in 1954. He earned his doctorate at the University of Rochester in 1958 and joined the WUSTL faculty in 1961 as an assistant professor of physics, working with Michael Friedlander, Ph.D. Klarmann was named an associate professor in 1964 and professor in 1974. He attained emeritus rank in 1996. "Joe was a quiet but outstanding member of our department's faculty," said Friedlander, professor of physics. "He was one of our best lecturers, a gentle and sympathetic advisor to students -- both graduate and undergraduate -- and a fine researcher." Marc Kamionkowski, Ph.D., a professor of theoretical physics and astrophysics at the California Institute of Technology, had Klarmann as an advisor while a WUSTL undergraduate in physics in the late 1980s. "Joe was my undergraduate advisor, teacher and research advisor, and always a tremendously supportive one," recalled Kamionkowski. "He played a big role in directing me toward what has turned out to be a truly rewarding career, and I am saddened deeply by the news of his death." The funeral arrangements will be private. The Department of Physics is arranging a memorial symposium for later in the semester. Klarmann is survived by his wife, Erika, of University City, Mo. ; two sons, Dan Klarmann and Peter Klarmann, both of St. Louis; and a sister, Ruth Kleinstein of Israel. Planned Parenthood of the St. Louis Region, Development Office, 4251 Forest Park Ave., St. Louis, Mo., 63108.